Mechanisms' Final Presentation Days | Space Agenda, The space related events calendar! This event will be preceded by the jointed event Multibody Dynamics Workshop 2010 to be held on the 2nd and 3rd of February 2010 in the same location. 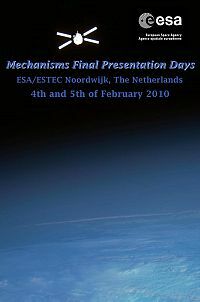 The main purpose of this “Mechanisms' Final Presentation Days 2010” event is to give to European entities (Industries/Companies/Institutions/Universities)the opportunity to present and discuss their latest Space Mechanisms and Tribology technology developments undertaken under ESA Technology Programmes (ITI, TRP, GSTP, ARTES…) and Projects funding. It is also aimed at highlighting new technology performances and potential applications, and promoting European entities competence in the field of Space Mechanisms and Tribology. Presentation of hardware is also encouraged. 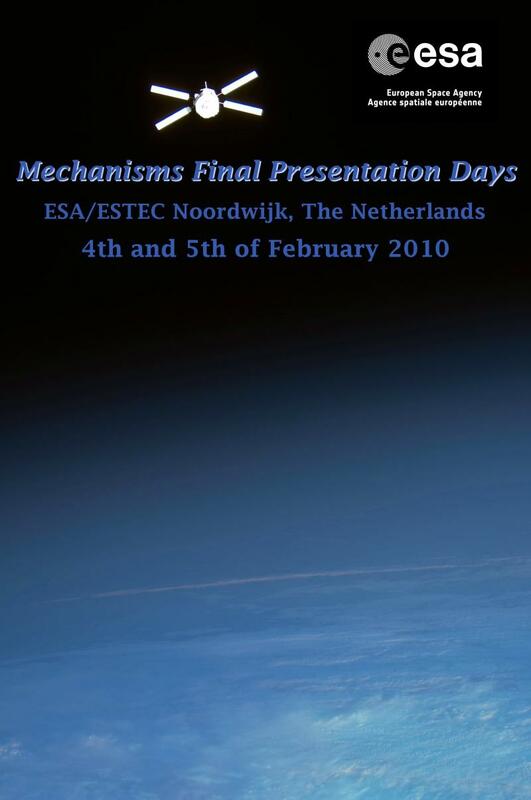 This event will cover development activities completed during the year 2009 (or near to completion at the time of the event) in the field of Space Mechanisms and Space Tribology supervised/supported by the ESA - ESTEC Mechanisms section.